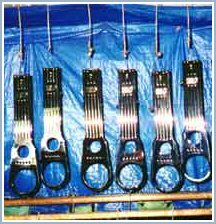 To attain the highest quality chrome, the product must be properly polished and plated. One step is not more important than another - they go hand in hand. When done correctly they will compliment each other. 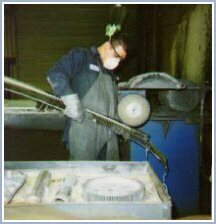 The first step in polishing is belting the product down to a new level, removing any pits, lines, or other undesirable marks. Then it must be buffed and detailed to a glass finish. The end result of the polishing will determine the final quality of the chrome. Then the product enters the plating department and this process is equally complex. The first step is properly cleaning the product - this step is very important to ensure optimum adhesion. This prevents the plating from bubbling or peeling. 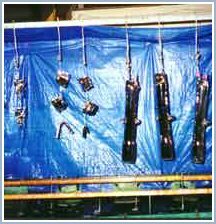 Every metal type has its own plating process. Aluminum is the most complex and difficult to plate. We specialize in aluminum. The condition of the metal dictates whether the product will be acid coppered or not. The first immersion process for aluminum is the cleaner. Then it is neutralized in nitric acid following a zinkate bath. This solution applies a zinc deposit to the aluminum, which allows the nickel to adhere. Then the product is nickel plated, then acid coppered to add leveling to the plating. Then the product gets copper buffed to an impeccable shine and finish for optimum results. Then, it gets nickel plated again. Finally the product gets chrome plated and the end result is a complete and beautiful item!